"Cruise tourists overwhelm Europe's ancient resorts"
I’m sure many people will have read this story on the BBC News website yesterday (16 July 2017). My response to the story has gone through the usual gamut of reactions – annoyance, analysis of the errors in the article, and eventual acceptance that there is a problem. and the article does accept that cruise passengers aren’t the only visitors to those places. But – there is no question that many places do experience tourist visitors on a scale that’s hard for them to accommodate; and that the number of visitors is affecting the experience that the visitors have. My own visit to the Acropolis in Athens, for example, was awful, and in Florence we felt that (as the article suggests) we were encountering only tourists or those serving their needs. Of course, many of these small, comparatively remote places have become much easier to get to in the last couple of decades. It’s not just cruise companies but also budget airlines – easyJet, Ryanair, Jet2, and so on – who have made access to Venice, Dubrovnik or Capri so easy. I can’t imagine how difficult it would have been to get to Venice even as recently as, say, 1990 – flight to Rome (from where? ), possibly followed by a really expensive flight to Venice airport, but more likely a complicated train journey through Mestre to Venice itself. 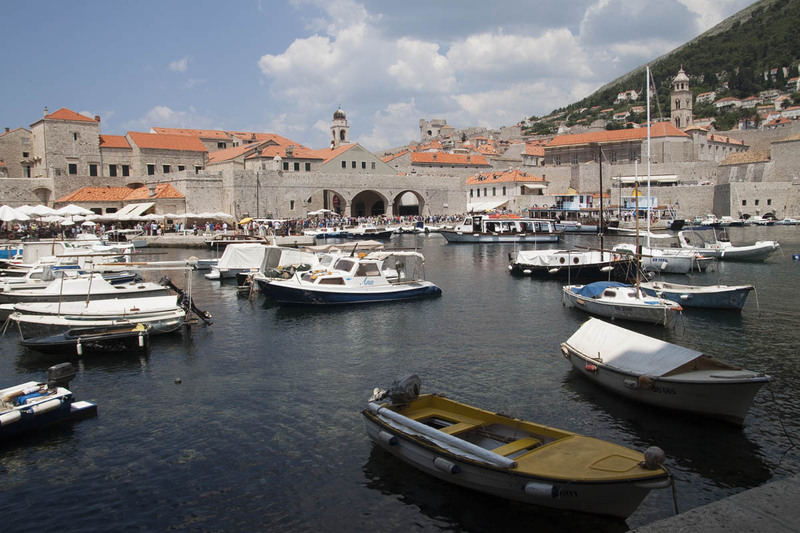 Similarly, Dubrovnik might have been accessible during the 70s and 80s, as communist Yugoslavia followed its independent line (independent of Moscow, that is) but at that time tourism was quite tightly controlled – the great majority of tourists came on package holidays and were encouraged to stay in the resort areas, e.g. Pula or Rovinj in Istria; visits to other places mainly took place as organised excursions. Then of course the Yugoslav war broke out in 1991 and it was the late 90s, or even the early 00s, before tourism recovered along the Dalmatian coast. By that time the budget airlines, and the cruise lines, were ready with their offerings. I also think that in the places where the protests are biggest, there is another factor at play. I know that in the case of Venice many of the local people feel that they have lost control of their environment. This isn’t just because of the numbers of tourists, but because of the structure of local government. Many of these places are quite small – the population of historic Venice is around 50,000, for example – but they are included in larger local government units. For example, the municipality of Venice has a total population of about 250,000, some three-quarters of whom live on the mainland and not in the historic city. The elected officials – especially the mayor, who in the Italian system has considerable power – are likely to draw the majority of their support from outside the historic city, and from areas where the concerns will be different. Residents of the historic city may have a different view on tourism promotion from residents on the mainland, for example, but it is the latter – who make up the majority of the municipality’s population – who will have the major say in decisions. It’s also the case that a crucial player in the Venice infrastructure, the Port of Venice, does not appear to be controlled by the municipality; it’s an independent authority (or so I believe). And of course it, too, is mainly based on the mainland (where there are significant container-handling and bulk cargo facilities), so once again the people most connected with the historic city feel that decisions that affect them greatly are being taken by an entity over which they have little influence or power. I apologise if this is coming across as rather rambling. That probably results from my own feelings, which tilt back and forwards on this issue. Of course I love going to these wonderful places, but more and more I’m wondering if, or to what extent, my presence (along with that of millions of other people, of course) is damaging the very places I enjoy visiting. It’s a difficult issue, and one on which I’m still undecided. Swithering, as the Scots say. I do except that I am part of the problem. If we some how restrict the number of visitors to the overwhelmed places, prices of travel will rise and the local economy including shopkeepers etc. will loose out.